New year brings new options to the game! 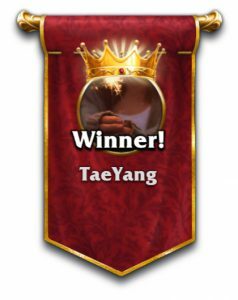 Share fantastic emotes with your opponent! You can find emote button at the bottom left of the screen and choose the appropriate reaction. The emote button appears when tapping any place on the board. If you find emotes distracting you can turn them off in the option settings when sliding the game board to the left. We also added Holiday themed stickers to the tournament boards with plans to introduce collectable stickers in the future so players can personalise their game. 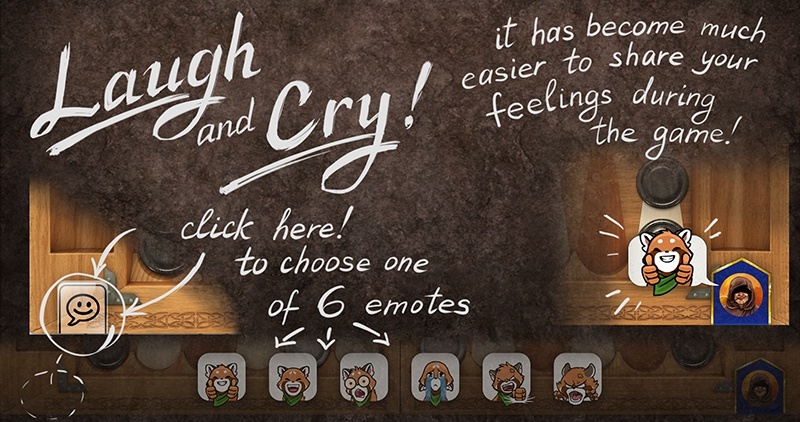 – Added 6 amazing emotes! Share your feelings during the game with the opponent! 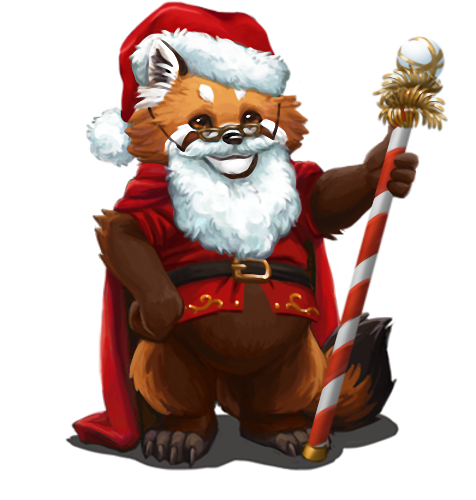 – Added wonderful stickers to boards during tournament games to reflect the Holiday spirit! Dear players, to celebrate end of summer we offer a new way to play with friends. First of all, we have reworked the friend system. We removed the limit of friends a player can have. Now you can also view any ongoing games your friends are having. 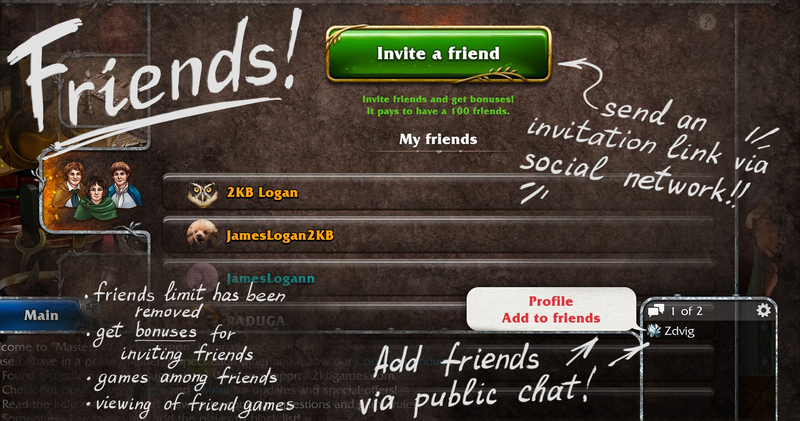 Friend list interface has also been improved. This is nothing magnificent in itself, but the feature had to be implemented as part of a greater plan. From now on players won’t be able to play no-money games with unknown players, only with friends. In future updates we also plan on removing option to choose opponent in gold games instead having an auto-matching feature to find a suitable opponent. This way it will become much easier to start the game. We also plan on adding something interesting for the projects anniversary. 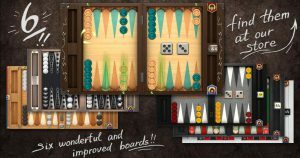 Update 1.7.12 includes new dice animation and also fixes in boards. We have completed the intended plans in regards to dice change. We also improved stability of the server. There will be lots of new and interesting features in the future. Stay with us! Today we released a minor update which mostly affects tournaments. From now on each match on a regular tournament will have a limit until two points, which gives players another chance to win in case of a loss. Time per move was also changed. More details below. – Quick “Sit&Go” tournaments are no longer displayed at the lower part of the tournament menu, only regular tournaments. – 64 player limitation has been removed from regular tournaments. Now any amount of maximum players can register for a tournament, however the minimum amount is limited to 32 participants. If there are only less than 32 people registered for the tournament, it will be cancelled. – Each match in regular tournaments now lasts until 2 points. This means that each player has a way to regain lead by winning with 2:1 and progressing to the next tour. 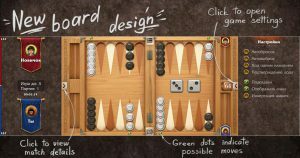 Bet cube in tournaments is now available and the winning mode (backgammon, gammon) affects points at the end of the game. – Changed time per move for quick “Sit&Go” tournaments and regular tournaments. Just like stated in international rules there are only 12 seconds per move right now and additional time (red timer) which is allocated for the whole match (all rounds in a game between two players). For quick “Sit&Go” tournaments this time is 2 minutes, for regular tournaments – 4 minutes, since in regular tourneys game lasts until two points. This way tournament games will become faster. Allocate your time wisely so you have enough additional time for the entire match. – “Time” field has been added to the readiness window. First value indicates green timer (time per move which refills), second value indicates the red timer (additional time for the whole match that doesn’t refill). 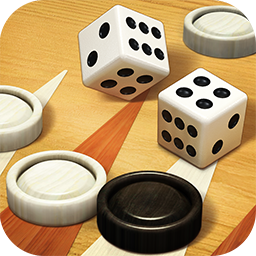 We are happy to announce the new update for Backgammon Masters. 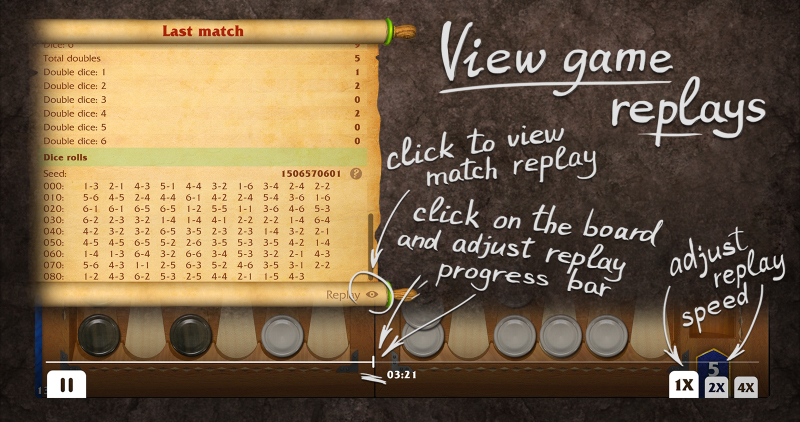 Additionally to fixing various bugs we also added a feature that allows viewing game replays. Now you can repeatedly watch replays of your games to analyse and improve. You can also spectate and watch replays of tournament games. In future versions of the app we plan on adding a feature to share these replays with other players in chat. To better illustrate important changes we added a notification window upon app launch. Hopefully this will clear up questions regarding new features. In the “Last match” window which is accessible from the main menu or after clicking the “Statistics” button at the end of each game we added a seed number for the generated dice. What does it mean? 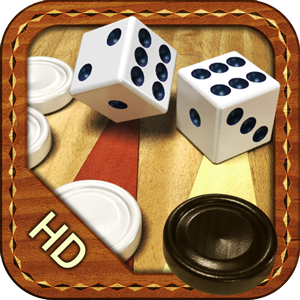 Read details on dice generation here. Using this Seed you can check the sequence of your dice rolls on our website. They have to match! As a reminder – we are using Mersenne Twister random number generator for our app. There is another positive change – we have updated the game icon. We hope you will like it. Update 1.7.3. is available! 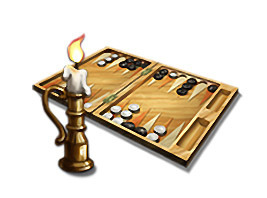 We fixed a bug in narde rules which allowed blocking of all 15 opponent’s checkers. We listened to your requests and brought back the previous checker control mechanic with slight alterations. We also implemented some design changes. Work on updates goes on and we will let you know our future plans soon.